Initially on arriving I wasn’t quite sure whether Austin would fulfill its promise to be in Texas, but not really a part of Texas. But after having been here a few days I’m ready to pronounce the capital of Texas a state unto its own. It is a state of mind well away from the plains and reigns which are associated with the land around. Geographically, Austin is in what they call the hill country. Everything is bigger in the mind of a Texan. These aren’t so much hills as piles and ditches by most standards. But it’s not arid here like much of the state, nor is it overly humid like the coastal cities. It’s warm and pleasant tonight after a high of 90 during the day. There’s a great outdoors area just south of the heart of downtown called Zilker Park. It’s packed this weekend since the weather is so nice. It’s free to come in and just wander around. There are many different areas but the one I was most drawn to was the Barton Springs Pool. This is a partially man-made rectangular-ish area with a diving board and life guards and a grassy hill on each side. But the water is constantly refreshed by a freshwater spring and at the opposite end it flows on down the river. The temperature hovers near 68F year round, which is just pleasant enough in the 85-90 degree days. In downtown it’s strange to say but you’re not reminded as much of Texas as you’d think. Even though you’re in Texas and the state capital is at the center of the city, it just doesn’t feel like what I’d expected. Granted I haven’t spent a whole lot of time in the state, but most of it has been driving through desert or underwhelmed Dallas and Houston. And just outside of Austin you get back to the sprawling suburbs and suburbanites that you expect from the state. But the city itself seems out of place. And that’s a good thing. Much of that difference is probably linked to two factors – University of Texas and the city’s status as “live music capital of the world”. The first brings a constantly refreshed pool of youth and diversity. As an example, when I was here there was a festival going on at the campus called the Forty Acres Fest. Lots of students out walking around, booths set up for the various university clubs and organizations. Games on the side like inflatable obstacle course, climbing tower, slam dunk, etc. Talked with the folks in the Travel Club of Texas – a group dedicated to talking about where they’ve been, where they want to go and raising money to go. And there were dozens of student union groups for different nationalities. I got a Malaysian drink and brownie from one fundraiser. Other groups included most of the nationalities of Asia. That’s surprising for a state often known more for its xenophobia than its openness. But this is Austin, not Texas. 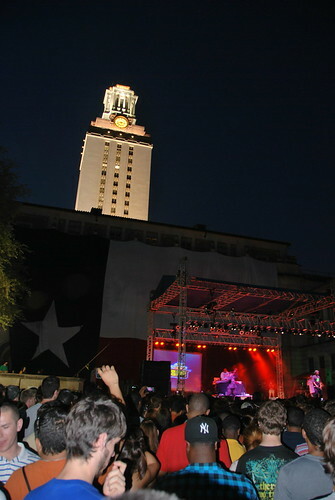 And the festival featured the other feature Austin is known for, live music. There were some local groups and some comedy improv during the changeovers. The groups were good – even the ones during the day. And I didn’t hear any country and western music. One band was clearly in the pop-rock scene. Another an indie group. One was a weird funk band that was as entertaining to watch as to hear. But the real highlight of the show was Big Boi of the group Outkast. Another Atlanta boy in town for the weekend. Posted on April 4, 2011, in USA and tagged austin, barton springs pool, forty acres fest, live music capital, music, river, texas, travel, university of texas, USA, weird, zilker park. Bookmark the permalink. Leave a comment.